I have a Cupcake Polish to share with you today. I was introduced to Cupcake Polish last year at Cosmoprof. I quickly discovered how amazing Cupcake Polish does holos! I received 3 of the Las Vegas Showgirls collection to review, and those were so amazing I had to purchase the rest of the collection. This is one of the colors I purchased. Folies Bergere is a bright cool-toned pink holo with silver flakies and holographic microglitter. 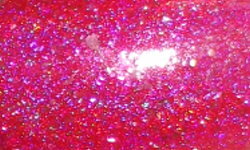 Color: This is an amazing pink holo. I love pink polishes, but they get kind of neglected these days. A great pink is hard to find in a see of "been there,done that" pinks. This pink is a showstopper. I love the current trend in spicing up holos. Let's face it holos are everywhere now, but adding in the silver flakies and holographic glitter really amps these up. Formula: Excellent and easy to use formula. This applied evenly and smoothly in 2 coats. Price: This is $13 on Cupcake Polish's website. Overall: I love Folies Bergere. This is beautiful bright pink polish with so many great holo elements. The formula is great and I don't have much else to add.